Fans of actor Charles Laughton and director Leo McCarey will probably look askance at this choice of film, often regarded as an early, minor success in each manâ€™s career. But itâ€™s a charming film, with Laughton rising to the challenge of a rare comic performance and McCarey settling into the easy style of filmmaking that typified his later career. Ruggles of Red Gap tells the story of an English â€œgentlemanâ€™s gentlemanâ€ (Laughton) who in 1908 is transported against his will from service in the household of an English earl to the American frontier town of Red Gap, Washington. In his strange new surroundings, Marmaduke Ruggles works as a manservant and dogsbody to the nouveaux riches Egbert and Effie Floud. After living for a time in Red Gap, Ruggles becomes infused with the spirits of democracy and equality and begins to consider abandoning a life of servitude to become his own man. I love this film because it features, in nascent form, one of the attributes that became a hallmark of McCareyâ€™s mature directorial style: the improvised scene. McCarey’s easygoing, collaborative approach to filmmaking is well documented, including the piano kept on the set for sing-alongs, the jokes and stories he told to lead his cast toward new scenes, and his keen eye for showcasing actorsâ€™ skills. He thought nothing of rewriting the shooting script on a whim, or spending a day shooting a new scene that had nothing to do with the storyline but that he thought might surprise viewers. As a result, McCareyâ€™s films tend to be episodic, loosely structured, and peppered with inspired moments not always closely connected to the storyline. The best known of these off-the-cuff scenes is Irene Dunne and Ralph Bellamy’s performance of “Home on the Range” in The Awful Truth, her poor piano skills rivaling his dreadful singing. But other moments are easy to pick out: Victor Moore and Beulah Bondi’s abandoned kiss in Make Way for Tomorrow; Cary Grant and Ginger Rogers’s drunken discussion of Browning, Shakespeare, and Irving Berlin in Once Upon a Honeymoon; and, from Ruggles, the scene (clip embedded below) in which Leila Hyams (as Nell Kenner) teaches Roland Young (as Lord Burnstead) how to play “Pretty Baby” on the drums. McCarey himself held that if he could string together the best such moments from all his films, he would have one truly spectacular movie. Ruggles of Red Gap shows McCarey working toward that style. Although the film takes only ninety minutes to tell a rather convoluted story, it several times takes a break for little comic scenes, often engineered to flaunt an actorâ€™s talents or ideas. Laughton maintained that he was partly responsible for the appearance of at least one improvised scene, in which Ruggles teaches Prunella Judson the proper way to make tea (â€œAlways bring the pot to the kettle. Never bring the kettle to the pot!â€). 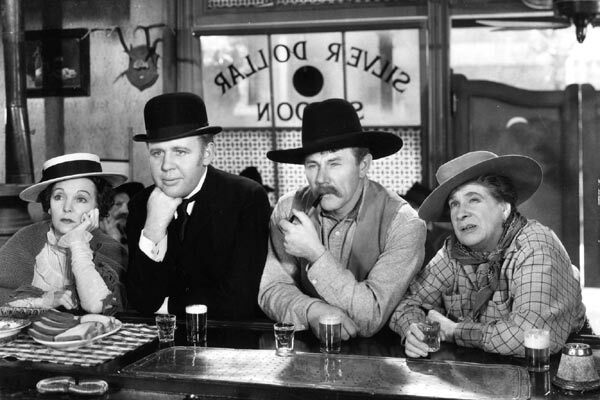 And of course the great time-out scene from Ruggles — unusual for McCarey in both its drama and its connection to the filmâ€™s narrative arc — is Laughtonâ€™s recitation of the Gettysburg Address to an audience of stunned bar patrons. Not an improvisational scene in the strict sense, it nonetheless arose from ideas developed on the set and was intended to show Laughtonâ€™s skills as an orator. McCarey was always keen to provide a happy, pleasurable experience to his audiences, and these scenes, exciting in their unpredictability and enlivened by the actorsâ€™ genuine laughter, keep his films fresh and delightful, even for jaded modern viewers. Thanks again, Keith and Jean! I’ve never heard of this film. I’ve loved Laughton since Canterbury Ghost. And is that Zasu Pitts in the photo? Love her too. Great pick! Can’t beat the cast (including Charles Ruggles, not mentioned above) or the director; McCarey was the bomb: in addition to cited films he did farce like Duck Soup and romance like Love Affair. Wow. Thanks, Karl. Duck Soup is wonderful, isn’t it? McCarey reportedly didn’t enjoy filming it, though, as the Marx Brothers were impossible to keep organized on set. His opinion, many years later, was that his best contribution to the Marx Brothers’ oeuvre was in cutting the musical interludes and concentrating more on the comedy. You’re welcome. And another thanks for enlightening us on McCarey’s working method — with this, you’ve raised him even higher on my Staircase of Hollywood Talent. Saw this on TV as a kid … it came with my mother’s recommendation. Loved it, though memories of specific scenes are dim. Wonderful movie, Ruggles. And a fine review, Jean. I would quibble only with your characterisation of Ruggles as minor. I think you prove, though not great, it’s noteworthy. Thanks, Peter. I wish Ruggles were screened more frequently — I think it’s one of the key films in both Laughton’s and McCarey’s careers. And as Karl says above, the cast list is wonderful. Leila Hyams even came out of retirement to play Nell Kenner.